Named after the song Jackie by British baritone Scott Walker, this nostalgia-tinged bar in Helsinki has been designed to evoke a 1970s Milanese bar. 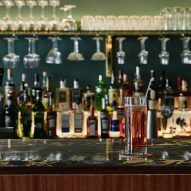 The Jackie bar's designer, Joanna Laajisto of Studio Joanna Laajisto, explained: "I was given a soundtrack of 60s and 70s Italian lounge music and 70s French cosmic disco by the owner, Antti Eerikäinen, to understand the ambience he wanted in the space. Best brief I have ever received." 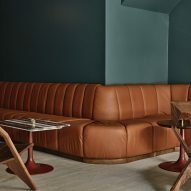 Using a palette of dark green paint, tan leather upholstery, dark woods and marble, Laajisto said she wanted to create the "atmosphere of a hotel lobby without the rooms upstairs". "The dark green walls and ceiling with long tan leather sofas take you away, maybe to a bar in Milan in the '70s," she said. "The Pipistrello table lamp designed by Italian Gae Aulenti in 1965 reinforces the illusion." "Live DJs play a big part of the bar's ambience and a special attention was given to the DJ booth," Laajisto continued. 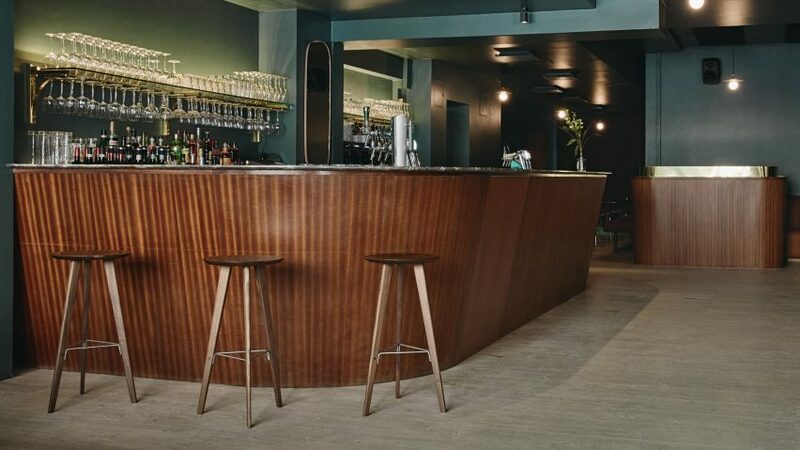 "Made out of sapele wood, it was designed to be a little sister to the bar counter." 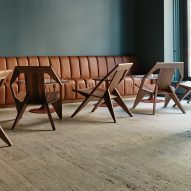 As well as custom-made tables with stripy inlaid marble tops designed by Laajisto, furniture includes the walnut Medici lounge chairs by Konstantin Grcic for Mattiazzi. Located on Helsinki's Iso Roobertinkatu – a street in the Punavuori area, known as the city's design district – the bar opened at the end of April 2017. As well as drinks, Jackie serves up North Italian-style pizza slices by renowned chef Antto Melasniemi. 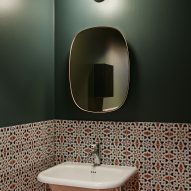 Earlier this year, architecture studio Atelier In Vitro took a similarly nostalgic approach to the renovation of three apartments in an old building in Porto, by restoring parquet and marble floors, and adding mid-century furniture.